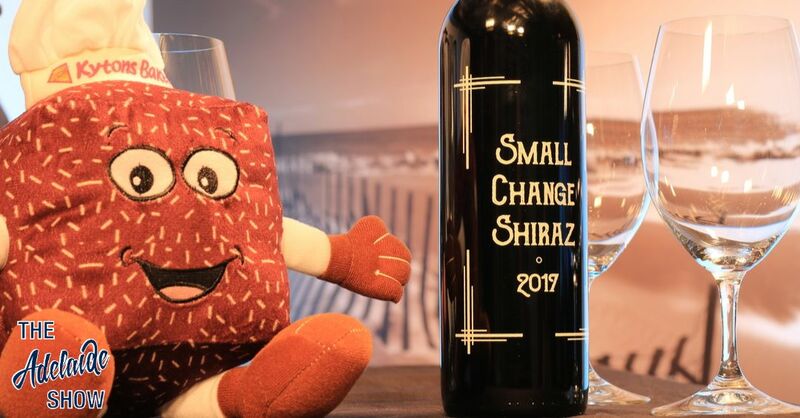 We opened a bottle of the 2017 Small Change Shiraz as the South Australian Drink Of The Week as part of the recording of episode 260 of The Adelaide Show podcast. Winemaker, Rhys Howlett, has long been adored by the podcast team for his music so it was decided that his wine should mark the farewell episode; the boys are taking a break after producing consecutive weekly shows for 260 weeks. Our guest for the night, Keith Conlon, was particularly fascinated by the Kangaroo Island headquarters of Small Change Wines and the fact that Rhys uses Bleasdale Wines at Langhorne Creek to process his SA wines, prompting Keith to recall watching the large basket press in action and having grape juice squirt onto his shirt. We think Rhys had Keith just on those two points alone, even before he’d tasted the wine! As a sidenote, we toast our late patron, Queen Adelaide, at the beginning of each show and this week, Small Change Shiraz was used to toast her on her birthday. PS In the photo, you can see the upcoming SA icon, Small Change Shiraz, next to an established icon, Larry The Lamington from Kytons Bakery. There's a lot to love about #SmallChange #Wines, not least of which is the #LanghorneCreek #Shiraz featured in ep 260 of The #Adelaide Show #Podcast. Thanks Rhys and the @drinkingSCW team for #wine and #music this week. https://t.co/k82wohnF6D Raspberry seatbelts? Strap in! The tasting began with Keith Conlon reading out the whimsical label notes: Do you make a Shiraz, I only drink Shiraz … etc. The label alone is worth reading. Rhys told the guys that this wine, being just a year old, was going to take some time to open up once the bottle was opened and, sure enough, that was the case. Steve noted the dark red in the glass along with some bright notes, illuminated by the TV studio lighting. Steve then recalled Keith’s splashing incident at Bleasdale and noted that there was an elusive taste like sucking juice from the laundered linen of Keith’s shirt as the wine swirled around inside his mouth, before a vaudeville style tap dance of tannin across the tongue at the finish. A very entertaining wine to drink. Nigel said the wine started with some berry for him, before signs of earth started emerging which, later, Steve said was like a little earthmover across his tongue. We are not sure our tasting notes of the 2017 Small Change Shiraz are going to be all that helpful this week, it was an emotionally-charged recording, but you can listen to them below, or by searching for The Adelaide Show Podcast 260 in your favourite podcast playing app. And, if you do list, keep playing until the end because we finish with Rhys Howlett’s song, Eagle On The Hill; a must for South Australian’s to enjoy.